This seems to be a banner year for hunting particularly elegant Snarks. The Cheshire Cat Press of Toronto last year published a fine-press Snark illustrated by Byron Sewell (42 copies, $350, KL 101:58), and will soon publish an identically formatted edition with illustrations by George Walker based on Donald Trump’s cabinet as the crew. Another being planned features cartes de visite selected by Andy Malcolm. Contact cheshirecatpress@gmail.com. Marie Christine Bourven of Reims, France, has produced a charming bilingual (French and English) accordion-fold artist’s book Snark ($100). Contact aimecbaime@aol.com (de préférence en français). 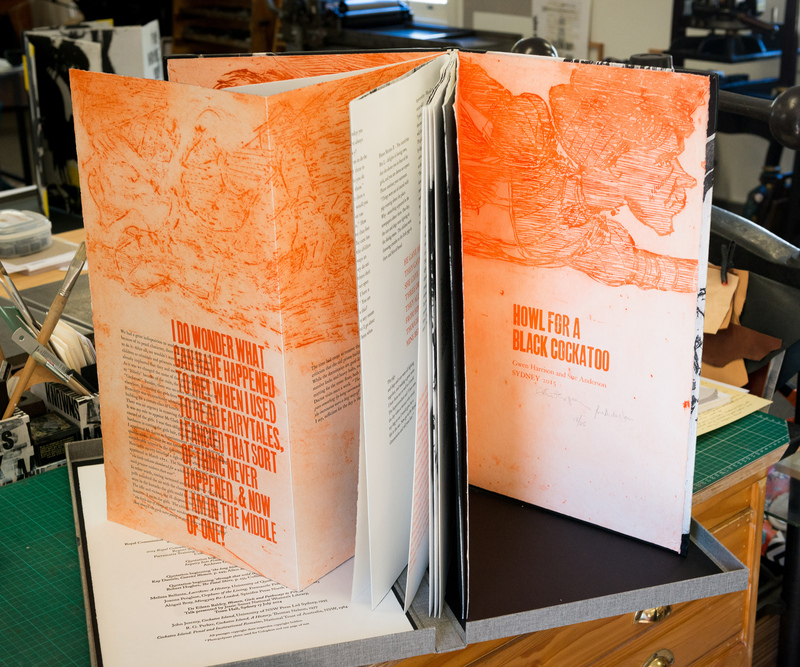 A most elegant artist’s book from the Chevington Press (UK)—distributed in the U.S. by Two Ponds Press of Rockford, Maine—is “illustrated by the lauded color-etching printer D. R. Wakefield, using contemporary characters to depict the members of the hunting party and even a portrait of the elusive Snark/Boojum. Wakefield’s etched portraits, ranging from Ted Hughes as the Broker to Morgan Freeman as the Butcher and the artist as the Bellman, bring a modern feel to this work.” Deluxe copies (#s 1 – 5) are bound in quarter leather, housed in a clamshell box, and contain an extra suite of the etchings ($4,700); “ordinary” editions #s 6 – 32 are $3,200. Contact KenShure@twopondspress.com. Two spectacular oversize artist’s books by Gwen Harrison and Sue Anderson of the Impediment Press in Australia consist of sugarlift and aquatint etchings with handset letterpress printing. Howl for a Black Cockatoo (photo above) and Phantomwise Flew the Black Cockatoo “tell the cruel and absurd history of a government institution set up in Australia in 1869, which continued up until 1975. Lewis Carroll’s remarkable texts were interwoven and layered with other text throughout both books, which allowed us to tell this previously hidden history, as without Alice’s help, reading such a dark history would have been unbearable. Howl is in an edition of 25 (au$7,000; us$5,000); Phantomwise is au$8,000; us$5,700. Contact wandringbarkstudio@gmail.com.